(Calocedrus decurrens) Tall and straight, single dominant trunk, bark looks like redwood tree, foliage like arborvitae. Great looking tree but is hard to find in nurseries. 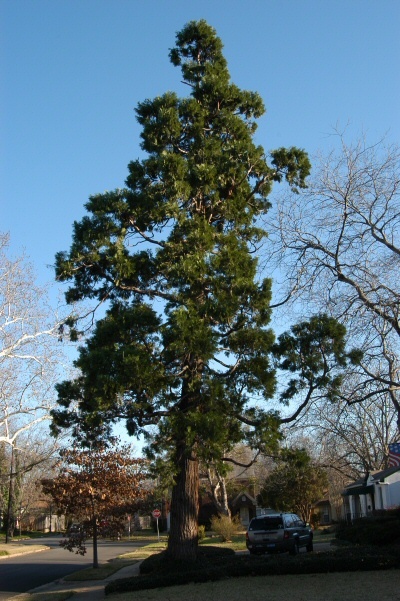 NATURAL HABITAT AND PREFERRED SITE: Incense cedar is native to Asia but has been used extensively in California. The specimens I know exist in black soil of Garland and in East Dallas. It has also been planted on the Plano campus of Collin County Community College. IDENTIFICATION INFORMATION: An upright evergreen tree with arborvitae-like foliage. It is tall growing, symmetrical and straight trunked. The foliage is very dark green and dense. FLOWERS AND FRUIT: Male and female cones form on the same tree. (monoecious). There are two winged seeds per scale. The larger wing is nearly as long as the scales. The small brown cones look like duck’s bills when opened. BARK: Reddish brown bark is relatively smooth on younger trees but develops very deep fissures, very much redwood like with maturity. FOLIAGE: Very dark green and similar in appearance to arborvitae. CULTURE: Incense cedar seems to be adapted to a wide variety of soils although very few plants have been attempted at this point in Texas. PROBLEMS: Finding the tree in the nursery trade and root rot diseases during establishment when being over watered and over fertilized. PROPAGATION: It can be grown from seed and stem cuttings under mist. INSIGHT: ‘Compacta’ is a dwarf compact form. Incense cedar gives off a very pleasant fragrance in the summer. It makes a beautiful specimen or can be planted closely together to form a windbreak or tall screen. As soon as we can increase the availability of this plant it should be used more often in Texas. Libocedrus is the old genus name. You can tell from these photographs that the plant does very well here in our alkaline soils.